Annie Munro born 1868 in Kilmuir, Ross to Alexander & Elspet Munro (ms Douglas). Photo was taken approx 1886. My nana's family of 16 children lived in Saltburn, but they were all born in Invergordon. I am really looking forward to finding people who remember my family or maybe even relatives. I too have Munros from the area and would love to see if there is a "cousin" connection. Katie, sure.........I look forward to hearing from you. 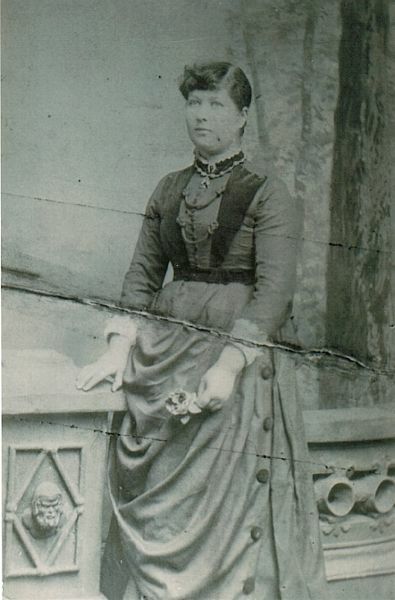 This is my Great Grandmother Annie Munro, married to my Great Grandfather George Mitchell. They were married 10th June 1892 in the free church manse (now the Church of Scotland). Annie died 5th November 1947, George passed a few years later on 11th November 1951. They were my Father, Anthony's grandparents. Frances Mitchell(ms), so that makes Annie Munro and George Mitchell my grandparents. I live in New Zealand with my two daughters, Sarah and Lucy. Annie Munro would have been my Great Great Grandmother. Her daughter Muriel May had a son called Neville Brian who was my granddad. He was brought up by Annie's youngest brother Daniel Munro. Hello, I would like to say that Annie Munro and George were my grandparents. I am the daughter of Herbert Mitchell - my name is Margaret. Muriel Mcburnie nee Mitchell, Herbies daughter. Good to see the photos. The photo is of my grannie Annie Mitchell nee Munro. My brother Johnny and sister Muriel lived in Bicester then Rosehill in Oxford before we moved to Edinburgh. I am Muriel McBurnie nee Mitchell good to read these coments again last saw Angie 48 years ago would love to hear from her again. Hello My name is Edward Guilar Annie and George were my great grandparents, their daughter Dorothy was my grandmother,she married Ronald Ferguson,their daughter Dorothy Ferguson was my mother.